Yesterday's 11:13 pm Blog post Blogged to you about the sheriff who came knocking. That sheriff told me to get off being parked on a county road. He suggested that I move a mile further up the road where I would be off county property. It turned out that this move took the Scampy Team to the top of the hill that we are camping on. This morning the Hilltop View so impressed Little iPhone that he took a pic from Scampy's door for you to see. 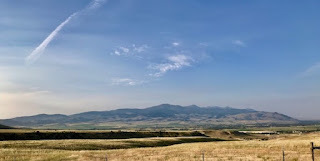 The view from Whitehall Montana's highest hill. George has been messing around on the Fiberglass RV board [Link] this morning and is still in his pajamas [For goodness sakes!]. He spent over an hour trying to locate an image for the post that he made on that board! Some have the belief that George may have a compulsive personality. We just had a Scampy Team meeting, the subject of which is staying put here in the Town of Whitehall. George has two projects which have been hanging fire, and he wants to knock those projects off the list. #1. Replace the ugly plumbing elbow thru which Mr. Yingli, our solar panel sends his power down to Mr. Renogy [Our solar battery charger]. 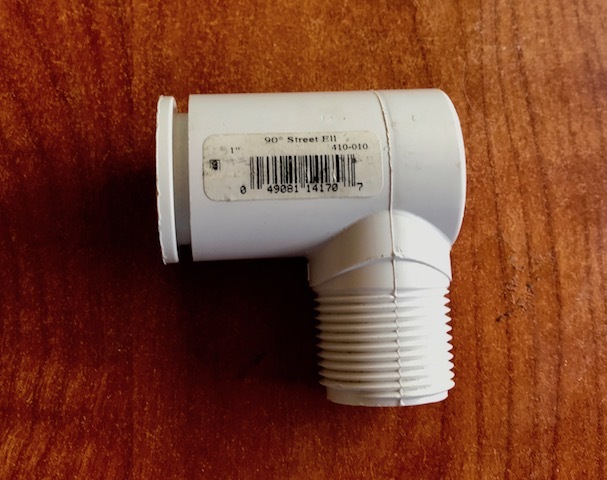 We bought a PVC 90° Street Elbow for that purpose at least 2-months ago! #2. Our plan for taking down and storing Mr. Wave3, our catalytic heater did not turn out as we believed it would. The weather here in the northwest gets cold at nights. Even during the Summer months. We want to re-install the Wave3, but this time make it a better-looking installation. Mr. Wave3 unsecured and just leaning against the wall. Mr. Wave3 now secured properly to Scampy's wall. PS: We have just ordered Mr. Wave3 a nice shiny new grill. The grill that he has now is so very sorry! The Wave3 re-install took 3-1/2 hours to complete. It was not easy for George to do this job. In fact, if you asked George how hard it was, he would reply, "Very darn hard!" And if you asked George, "Why don't you just kick back and pay others to do this hard work?" "Good question! ", would be George's reply. And then George would likely let you know why. 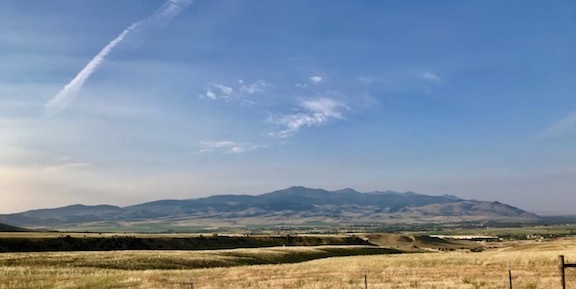 "If I stopped doing hard stuff like this install, I believe that I would be shrinking from the very things that make my life a wonderful thing for me." "Me shrink from my life? Never happen!" "When they find me dead, I'll be lying on the ground and have a hammer in my hand. And I'll be working to fix something broken on Scampy." Those who find my body will say of me, "Look at that! The guy died with a hammer in his hand! Just like John Henry!" Pete Singer performs "John Henry"
Following your A/C install. Wouldn't it be easier to mount the A/C unit in the side or backwall of Scampy? Any auto body shop could cut (neatly) the fiberglass and make an angle iron frame and set the unit on it. Easy to run the cord etc and this way no chance of leaks! Me? Have a hole cut into Scampy's wall?? When there is already a hole for the new A/C in Scampy's roof! BTW: Scampy just read your, "....Any auto body shop.." comment. You should know that you hurt her feelings deeply! so now I can ask the question, when you get this air-conditioner set up ready to run. how are you going to get electricity to it. I thought you only had 1000 W generator. Or am I wrong. This Frigidaire Air Conditioner operates on 450 watts of electrical power. You are the man with the calculations. Will my 1000 watt Honda do the job? 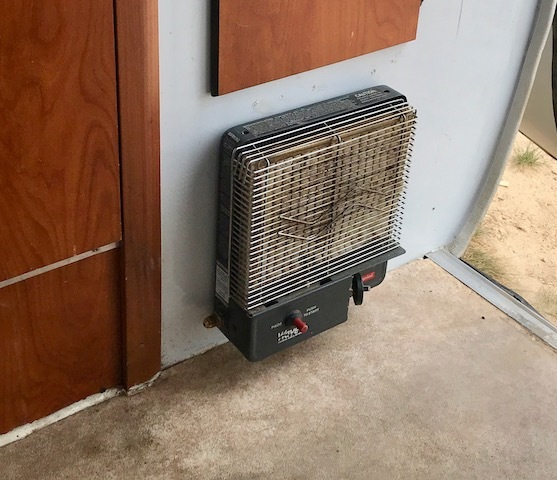 Because your air conditioner doesn't have what they call a soft start, that means that you're going to get a spike at first initial start up. Let's say twice that wattage which would be 900 W.
So on paper it's doable, but impracticality you may find it will kick out on you. But I'm sure you will deal with that when the time comes. I'm speaking from experience, I had a 1000 W unit and a room air conditioner in my cargo camper trailer. I had to upgrade my generator to an 1800 and it worked great after that change . Those power demand figures sound doable for a 1-kw Honda generator! Hi George, you will be pushing the Honda 1000 to limit on start up of air conditioner. you'll have to leave it off the eco mode if you're going to let air conditioner cycle. if you let A C run continuous on cool mode you should be able to use the eco mode on generator. I only will use the A/C where I have shore power. For example, I needed A/C when I nearly killed myself because of being overheated at the FMCA show during mid-July. If ever I find myself in a place that is too hot, and I really want to camp there, I'll buy a 2000 watt Honda. Your comment to Ray clears up a lot. I was under the impression that you were going to use that air-conditioner and generator at your night or hot day camps . But On shore power piece of cake. Do you recall when I was camping at the FMCA Rally last week? I came close to killing myself [Boid too!] by heat stroke because I took a nap when the temperature was way too high! That incident decided for me the necessity for an A/C unit. This Frigidaire A/C that I bought is just the right size for Scampy. 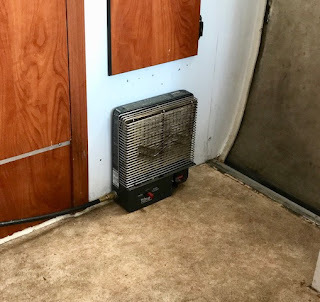 Buying an A/C designed for a trailer is, in my opinion, a huge error! Much better by far to buy from A/Cs designed for homes. ie; Window units. 4. Quiet A/Cs are plentiful in the window unit market. All that I need to do for the install is go to a welding shop and have a steel frame fabricated. The frame will duplicate a home window frame which allows the A/C to be installed in the same position as an A/C installed into a home window. The back end of the A/C will be positioned over Scampy's roof allowing condensation to run on to the roof and then to the ground. There will be a cover [Sort of an open box] attached to the opposite side of the steel frame. This box will seal against Scampy's roof and be open to the room below. I will be able to reach up into that box and operate the A/C controls. The electrical cord that comes with the A/C will be stubbed off short [6"]. An extension cord will be attached to the stub cord to connect 120 volt AC power.